Despite reciting these verses repeatedly, they never fail to amaze me… SubhanAllah! And behold! Your Lord has inspired the bee with this “Build thy hive in the mountains, trees and in the creepers over trellises: then drink nectar from every kind of fruit, and follow the ways made smooth by the Lord.” From its belly comes out a fluid of varying hues wherein is healing for mankind. Here is indeed a Sign for those people who ponder over it. – Quran, An Nahl v 68-69. 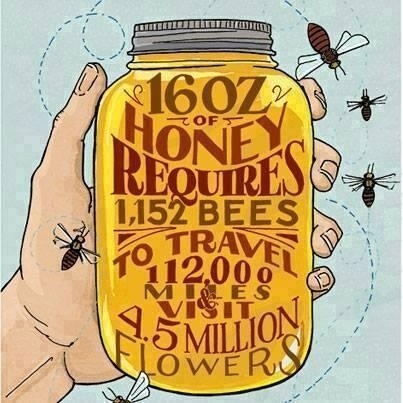 It takes the entire lives of 12 bees to make 1 teaspoon of honey… We can not begin to fathom the mercy of our Lord. This entry was posted in Personal Reflections, Quran and tagged Allah's mercy, An-Nahl, appreciating nature, bees in Islam, blessings of honey, conserving the environment, cure in honey, honey bees, mother nature, nectar, Pollination, Quran, Remembering Allah, science and Islam, spiritual reflection, thank Allah. Bookmark the permalink.